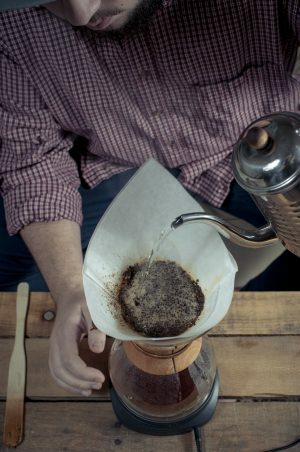 Pourover - Making the Best Cup of Coffee at Home - Utopian Coffee Co.
To many of us, coffee signifies the beginning of our day. We carefully integrate coffee into our morning, afternoon, and evening routines. We cherish the moments when we can take a step back from our busy schedules and take a moment to sip our life-generating brews. For some, coffee is an absolute necessity to any productive day. With something so integral to our daily routine, one would think the coffee brewing experience would be just as important as the end result. More often than not, the brewing process of coffee is completely overlooked, and as a result our coffee tastes less than ideal. Luckily, there is a way to brew delectable cafe-quality coffee at home. 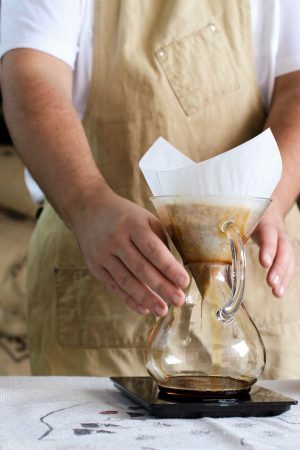 Using the pourover brew method will give you coffee that tastes outstanding. Imagine the classic coffee brewer: you wake up, flip a button, and coffee is brewed and ready in a few minutes. Unfortunately, these coffee brewers often do a terrible job of extracting the greatest amount of flavor from the beans. Brews are left under-extracted which cause a serious lack of flavor as well as an overall underwhelming experience. Especially when you’re spending the money to buy well-roasted beans, your brewing experience should reflect the standard of quality necessary to bring forth the most flavor. Having control of these factors gives you the opportunity to brew coffee which reflects the depth of flavor and complexity of each bean. 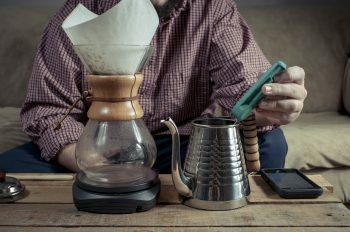 Additionally, making a pourover not only creates awesome tasting coffee, but it takes the very impersonal experience of an automatic coffee brewer and makes coffee-brewing personalized and intimate. Taking time to bring the water to temperature, weighing and grinding the beans, and finally controling the entire course of the brewing process creates a unique and beautiful experience. 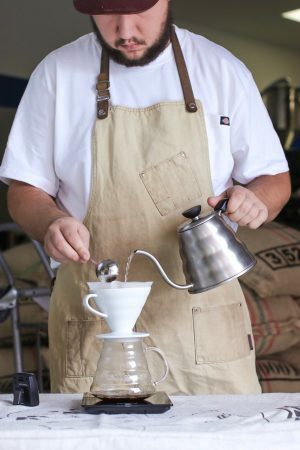 Now that we have covered some of the fundamental aspects of pourover brewing, we will review the necessary pieces of equipment used during the brewing process. The dripper is the key piece of equipment used to brew pourover coffee. Essentially, it acts as the context where the coffee brewing process will occur; where the magic takes place. Drippers vary in size and shape from large to small, flat bottom to conical, glass to metal. Choosing a dripper is a matter of deciding what best fits your brewing needs. If you’re looking to brew only a single cup for yourself in the morning, the dripper you choose will greatly differ from the person looking to brew for several friends. There are two drippers I highly recommend to anyone who is interested: the Hario V60 – 02 and the Chemex – 8-Cup. Both are conical brewers, which aid to facilitate extraction. 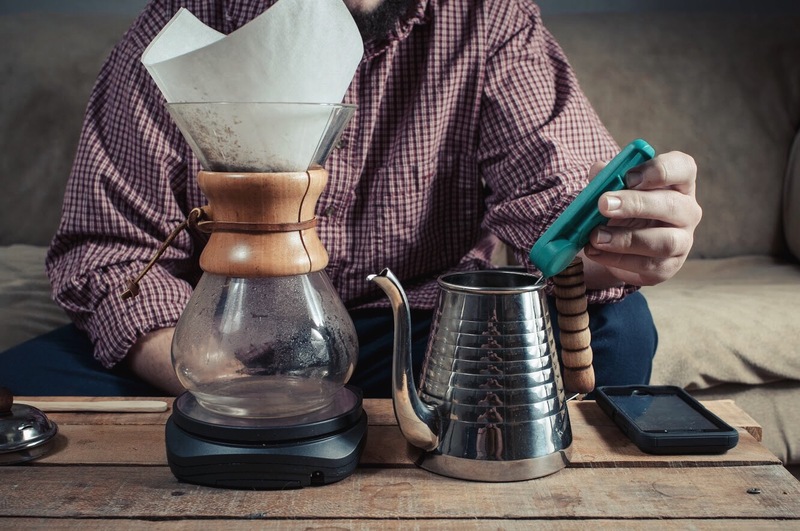 Many cafes use the Hario and Chemex because they’re recognized as fantastic brewers. 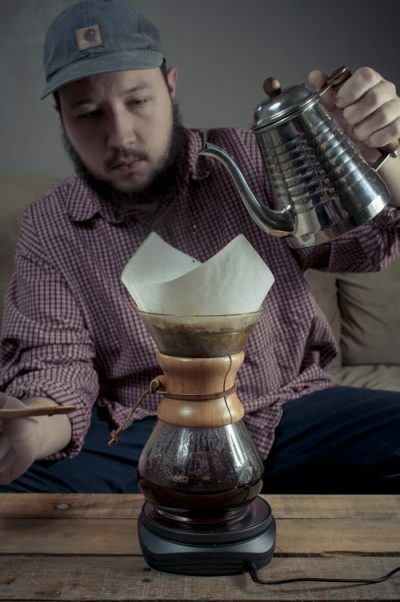 Additionally both the Chemex and V60 work well for a variety of different budgets. I personally use a ceramic V60 and the 8-Cup Chemex. The kettle is used to pour hot water into the dripper and onto the ground coffee. You do not want to use a regular kettle, such as grandma’s favorite tea kettle. Most of these kettles have a very large opening to pour water into a mug, but for pourover brewing this does not give sufficient control over the brewing process. Rather than a classic tea kettle, a gooseneck kettle should be used. The name reflects the type of spout, which is thin and curved to restrict water flow as well as maximize control over pouring. A well made gooseneck kettle will allow for complete control of the water throughout the brewing process, which will allow you to dial in your brewing recipes accurately and effectively. Likewise, since the stream of water from the kettle is much finer, it will be easier to cover all the coffee ground evenly, which will aid in extracting the most flavor. The water used should be heated to about 195-205 degrees fahrenheit. 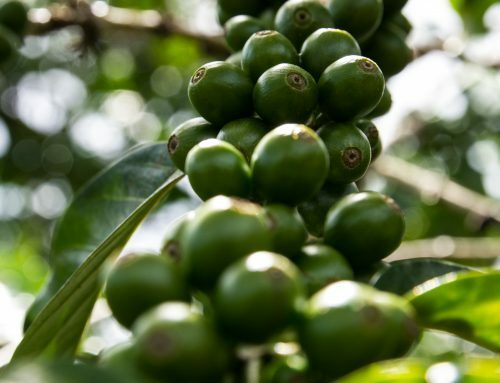 Temperatures higher than 205 tend to “burn” the beans, which will leave the coffee tasting flat and lifeless, while temperatures lower than 195 generally will hinder the extraction of flavorful solubles, also leaving the brew underwhelming. If a thermometer is not readily available, allow the kettle to boil and sit for two minutes. By this time the temperature should be within the given parameters. 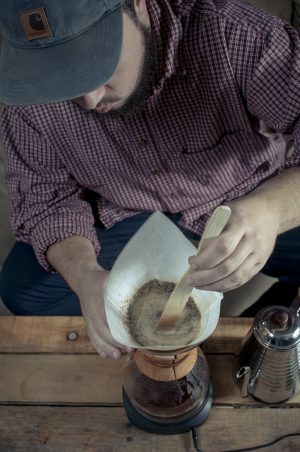 The pourover process is made null when using pre-ground coffee. As with any pre-ground coffee, a majority of the important flavors and aromas are entirely lost quickly after grinding occurs. Because of this, I highly recommend purchasing a grinder. This will ensure you are obtaining the greatest amount of flavor. Whole bean coffee used within 3 weeks of the roast date is going to give the best flavor. This coffee is still fresh and retain most of the delicious flavors. 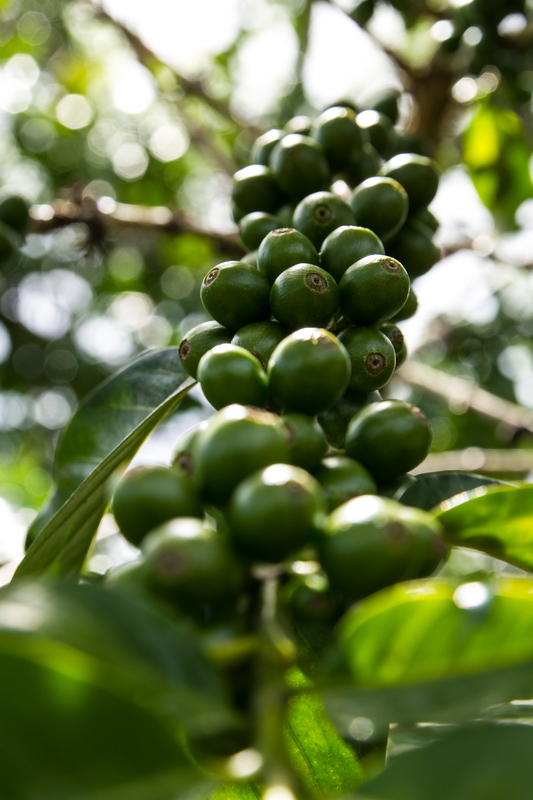 After 3 weeks, coffee naturally starts to “stale,” which like most food products means the flavor will be lacking. The grinder you choose to use will make all the difference for the ensuing brew. For this, there are two types of coffee grinders available: burr and blade grinders. In essence, blade grinders use blades that spin rapidly to crush, chop, and slice the coffee beans into usable grounds. While blade grinders are relatively inexpensive and easy to use, they will not grind the coffee accurately nor evenly. Because the blades are merely spinning rapidly and grinding the beans, this means there is no assured way for each bean to grind the same. Simply put, you will end with some beans that are nearly whole, while some beans are fine as dust. The alternative which I highly recommend are burr grinders. In essence, two burrs (either metal or ceramic) are used to crush the beans into a specific size. Because of this, burr grinders tend to grind each bean to a specific size, resulting in remarkably more consistent grounds. This being said, the cheap burr grinder found at the local grocery store will not grind much better than your average blade grinder. At Utopian, we offer two grinders. The Baratza Encore is a great entry-level burr grinder that does an amazing job for a relatively inexpensive price. This grinder is reliable, and works perfectly for anyone looking to step into the world of manually brewing coffee. A majority of the settings work very well from pourover, as well as other brewing methods such as Aeropress and French Press. I cannot recommend this grinder highly enough for anyone looking for their first burr grinder. Another option is the Baratza Sette 270. Think of this grinder as the luxury version of the Encore. The Sette will grind more consistently, as well as grinding finer for home espresso use. Aesthetically, this is a beautiful piece of equipment which will undoubtedly bring your home brewing game to a new level. To brew coffee well, you need to know exactly how much coffee is being used, as well as how much water to use. Using too much coffee and too little water or vice versa will result in an unpleasant brewing experience. Thus, weighing coffee and water are extremely important steps that ensure the quality each brew. By these variables, you can create a brew ratio. One common brew ratio is 1 x 16.5. This means for every one part coffee, you will use sixteen and a half parts water. For example, if you decide to use 30 grams of coffee, you will multiply 30 x 16.5, resulting in 495, which is the amount of water you will want to use. This ratio is not set in stone by any means. If you want your coffee be stronger, try a 1:15 brew ratio, and if your coffee is too strong, try 1:17. 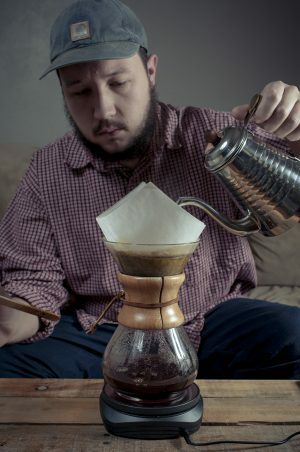 Mastering the art of pourover coffee takes time and persistence. As stated before, making coffee in this method is not about efficiency, but rather about the ritual of brewing. Patience is key to making great coffee. Start the timer and begin by pouring 100 grams of coffee over the grounds in a clockwise motion. The water stream should be thin and cover all the coffee grounds. Use a spoon to then stir over the next 25 seconds. At 45 seconds, add water in the same circular motion (slowly and deliberately) until reaching 250 grams at 1:20. At 2 minutes, repeat the previous step until reaching 450 grams. At 2:45 finishing the brew by reaching 660 grams total. Stir one last time, you should shoot for a flat bed of grounds. Start timer and add 80 grams of water to the brew bed, covering all the coffee grounds. Use spoon to stir grounds, thoroughly soaking the coffee. At 30 seconds, pour water in a clockwise motion until reaching 150 grams. Around 1:20 add water until reaching 300 grams. At 2 minutes, finish the brew by reaching 400 grams water. Stir one last time. Like the Chemex, shoot for a flat bed of coffee grounds. Coffees roasted lighter will generally need a coarser grind size, while darker coffee will need a finer grind size. Using tap water can work sometimes, but for the best results, use re-mineralized water. This will aid in extracting the key flavors. Focus on your rate of pouring. If you pour too fast, you will speed up the entire brew, while pouring too slowly will cause the brew to slow down, or worse, stall out. Fresh coffee is key – using old coffee will generally result in a very poor brewing experience. 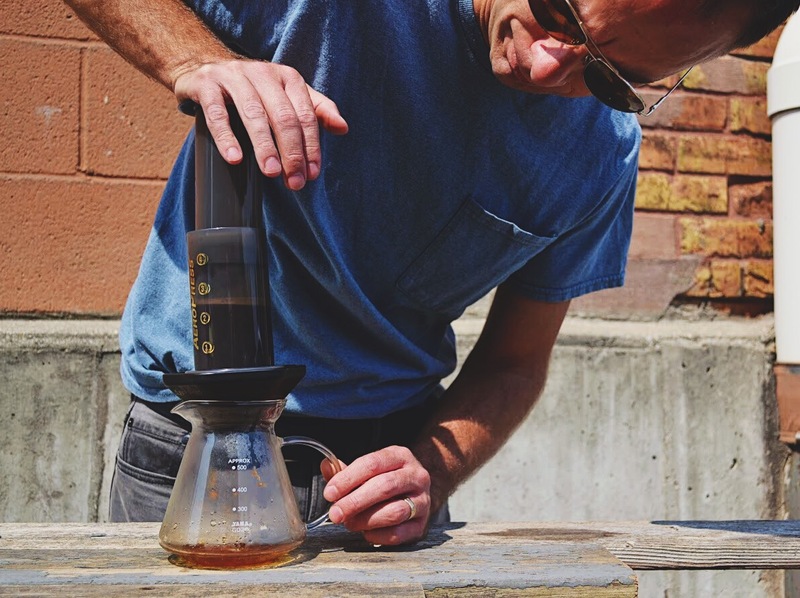 Invest time into learning the craft – take a few minutes a day to make a pourover. Record your results in a notebook for reference later on – you may find that different coffees need different ratios.